Pablo: Mothers, fathers and loved ones of those who died in New York, soon will be the 29th anniversary of our tuesday, 11th of September and the first anniversary of yours. We will remember you. I hope you will remember us. 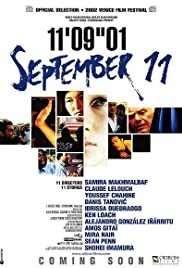 Given the nature and origin of the 11 filmakers it is not surprising that this film is at best neutral in its stance towards America. Probably the most 'anti' segment comes from Ken Loach who is definitely not towing the British New Labour party line. Although those events of a year ago are shocking and painful to most Americans and most spectators who saw them unfold live through CNN etc. the majority of the writers and directors choose to show that tragedy is not an American monopoly. Should anybody be surprised that these 3000 deaths are given the same weight elsewhere as the West gives to thousands Tutsi, Tamil, Bosnian, Chilean, Kurdish (need we go on) victims. If this was a 'wake-up' call for the States then it is equally tragic that in the subsequent 12 months the Israel/Palestine impasse is further from a solution while George Bush Jnr. would rather wreak revenge than make the world a safer place. I think many of the contributors wonder where the idealism of the Founding Fathers went, and why America orignally built as a bastion of freedom, justice and tolerance now sees its self-interest paramount while the Third World wonders where the next drink, meal or bullet is coming from.